One thing I have never had to force my kids to do is read. They love to read and they still love our read aloud time. 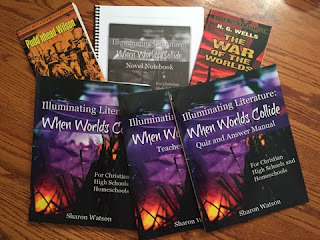 When I told them we were going to review a brand new literature course from Writing with Sharon Watson called Illuminating Literature: When Worlds Collide the first thing they wanted to know was what books do they have you read. They were pleased with the selection, and couldn't wait to get started. Illuminating Literature: When Worlds Collide is written for Christian high schools, homeschools, and co-ops. There are 70 student-directed lessons with reading schedules, and this two-semester course will give your student one credit for language arts or English. It takes you through 8 books with colliding worlds. They were chosen for their literary value, and their potential to help students make moral, ethical, spiritual, and life choices from a Godly perspective. The student will learn 44 literary terms, and elements. Illuminating Literature: When Worlds Collide (Student Book) ~ This 285 page softcover book is written directly to the student. The introduction chapter talks about what literature is, what is the philosophy of the course, and about colliding worlds. Each book chapter has a section to read before starting the book. It gives an introduction with a suggested reading and homework plan, and tells us about the author. After reading the student gets to rate the book, take online quizzes, and answer questions. There are vocabulary words, questions, discussion questions, and a list of activities. There is also a list of books that you may enjoy if you liked the one you just finished. Illuminating Literature: When Worlds Collide: Teacher's Guide ~ This softcover book is 182 page answer key and guide. It contains a schedule for the year plus a grading grid to help in giving the student a grade. It also includes the answers to the questions in the Student Book. Illuminating Literature: When Worlds Collide: Quiz and Answer Manual ~ This book is for students or teachers who prefer to have the quizzes and opinion surveys on paper. The online quizzes can be accessed free with the links and passwords included in the Student Book. The online quizzes are automatically graded and the results will be sent in an email. The quizzes in this book may be copied for your personal use and the answers are included in the back of the book. Illuminating Literature: When Worlds Collide:Novel Notebook (Free PDF Download) ~ This 102 page notebook is free to download. This journal should be kept handy while reading the books. The student can take notes here, include their opinions about certain topics and write down examples of literary terms that they find while reading. I have been using this course with Amber (age 14) and Delaney (age13). We received the physical copy of the Student Book, Teacher's Guide, the Quiz and Answer Manuel, Pudd'nhead Wilson, and The War of The Worlds. The Novel Notebook is a free download that we printed and had spiral bound at our local copy store for just a couple of dollars. I purchased an additional Student Book, so my girls could work through this together. If you read the exact books that I have linked above there are page number references included in the curriculum to help the student find exactly what they need very easily. We read the introduction chapter together and then got started on the first book, Pudd'nhead Wilson. I have never read this book and after reading the Before You Read section and learning more about Mark Twain I wanted to read it, so I decided I would use this book for our family read aloud. That was a great choice for this book, but I am having the girls read the next book, The War of the Worlds, themselves. Pudd'nhead Wilson was a great book to start this course with. It is very easy to see the different conflicts throughout the book and is perfect for When Worlds Collide. The questions for this chapter included picking out several conflicts of different characters. There are several discussion questions to choose from, and you do not have to use them all. Suicide and abortion are included here, but is very appropriate for the age of the students. Some of the additional activities included creating your own calendar of witty sayings like Pudd'nhead Wilson's, writing short stories, create a timeline, additional research and more. My family loves when I read out loud to them. My youngest daughter (10) sat with us while I read the Before You Read the Book to Pudd'nhead Wilson and learned about Mark Twain. We all found this very interesting and it built anticipation to read the book in all of us. In the first chapter of Illuminating Literature it discusses different types of conflicts with the characters. The explanation was so well done, that Alaina was picking out different types of conflicts while I read. They all loved rating the book, and everyone rated Pudd'nhead Wilson high. There is a section titled If You Liked This Book...... that suggests other books that you may like. The recommended titles are good matches, because we had already read 5 of the 9 that are listed and we liked all of those too. I had heard many wonderful things about Writing With Sharon Watson curriculum and I knew I wanted to review this one. Delaney loves to write and I am thinking about ordering her Writing Fiction In High School: Bringing Your Stories to Life! After talking about the conflicts from Pudd'nhead Wilson in When Worlds Collide she has created more conflict in the story she is writing now. 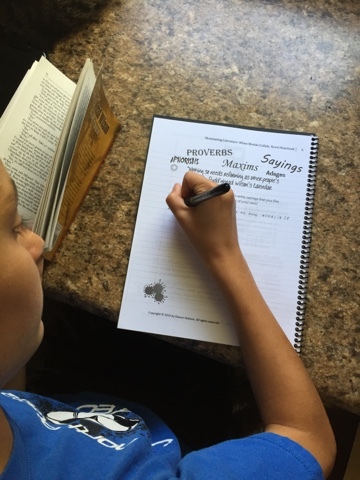 This homeschool literature program is very easy to use, and really got my girls noticing things in the story as we read. If you are looking for a Christian literature curriculum this would be a wonderful choice. Hi, Lisa! It's funny you mentioned how reading about Mark Twain made your family anticipate reading Pudd'nhead Wilson. My husband is one of my best editors, and at the end of every chapter in the textbook, he'd say it made him want to read the novel! And he has read many of them by now. Thank you for such an enthusiastic review of Illuminating Literature. I love it that you read aloud to your girls. What a gift to them!